Does Energy-Efficient Window Glass Help with HVAC Costs? What is a U-Factor and which type is best for your climate? Does the Glass Really Make a Difference? With so many options out there, it’s difficult to know what to look for in a quality, energy-efficient window. One of the most important aspects of a replacement window is the glass used to make the windows. While all window glass may seem the same at first, there are several factors that differentiate glass that can affect the performance of your window and your overall HVAC costs. Low-E is an energy-efficient coating that will minimize the amount of ultraviolet and infrared light that can pass through the glass and into your home. Low-E coating helps either retain or reflect heat into your home while reducing energy costs throughout the year. Argon and krypton gases add enhanced energy efficiency to your windows to help minimize heating and cooling loss through glass. Both gases perform as an insulator and work with the Low-E coating to give you a comfortable home. Here are some helpful facts about argon and krypton gases to help you choose which is right for your windows. Argon gas is colorless, odorless and denser than air. Argon gas increases R-values and noise control and is best used when there are larger gaps between window panes. Krypton gas is the more expensive of the two insulating gases, but it acts as a better insulator. Krypton gas is also colorless, odorless and can significantly reduce outside noise. Triple Pane Glass – Triple pane glass is made up of three individual panes. Coupled with Low-E coating and argon or krypton gas, triple pane glass windows are the most energy efficient. Double Pane Glass – Double pane glass is made up of two individual panes. This is the most common type of glass used in windows. 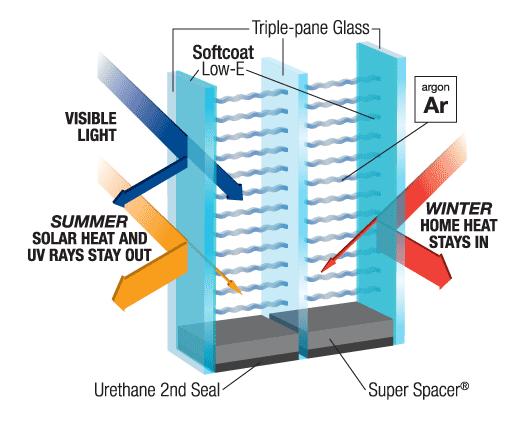 Double pane glass windows are good insulators when Low-E coating and argon or krypton gas is added. Single Pane Glass – Single pane glass is made up of only one glass pane. Other than keeping the elements out, single pane glass does very little in terms of insulating. What Do I Look for in an Energy-Efficient Window? When shopping for energy-efficient replacement windows, make sure that each window you plan to buy has been independently tested to meet the necessary performance requirements and has the certification label affixed to it. Here are a few certifications to look for in quality energy-efficient windows. The NFRC is a nonprofit organization whose goal is to provide accurate information and labels so customers can compare energy-efficient performance in windows, doors and skylight products. The National Fenestration Rating Council® independently tests and certifies each window and door to educate a consumer on the window’s U-Factor, Solar Heat Gain Coefficient and Visible Light Transmission. NAMI specializes in fenestration and building envelope products which include windows, skylights, patio doors and entry doors. This agency provides Certification Inspection and Quality Assurance Services to the building industry. ENERGY STAR certifications are based on the minimal standard for performance a window must meet in a specific climate to ensure low energy costs. Companies that have had their windows tested, certified and labeled are assuring you that the products being installed in your home meet all the necessary performance requirements. What is a U-Factor (U-Value)? When purchasing a new window, it’s also important to look at the U-Factor, but what does that mean? A U-Factor is the measure of heat transfer from the entire window including the frame, sash and glass unit. A lower U-Factor means the window has a greater resistance to heat flow and higher quality insulation. When you choose a window, it should include an NRFC label that displays key energy performance ratings of that specific window as well as an energy-star label. Make sure to discuss the labels with your window replacement company to learn more and find a window that fits your specific energy efficiency needs, based on your climate.